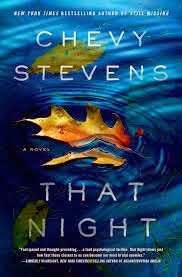 I really enjoyed Chevy Stevens debut novel, Still Missing, in the quickly-consume-it-all-in-one-day kind of way. I haven't had a chance to read her more recent novels, so when the opportunity to review That Night popped up, I quickly jumped on it. Unfortunately, I haven't really had the ability/time to consume a book all in one sitting lately, but That Night was still a compelling and quick read and one I looked forward to sneaking in a few pages when I could. It's the story of Toni, a girl that's troubled as a teen with a stressful relationship with her parents. She has a boyfriend that they don't approve of, they see him as a reckless and rebellious teen in trouble with drugs, etc. And she has her own mess of mean girls that really hate her and make her life completely miserable by constantly bullying her and lying in order to ruin her reputation. While Toni certainly isn't angelic, her actions don't mean she's a murdered which is what she's eventually accused of. That Night alternates time periods between the paste and present as Toni deals with being falsely accused and charged with murdering her sister. It's pretty compelling reading! While enough hints were given for me to feel like I sort of knew what was going on, the way everything unfolded remained a mystery to the end. Oh and also I felt properly angry at EVERYONE for the way they treated Toni. Also based on this book and Still Missing, I do wonder what Chevy Stevens thinks of mother/daughter relationships! I received a review copy from the publisher!